Command & Conquer: Generals is the seventh release in the Command & Conquer series. It is the first full-3D real-time strategy title in the series, using the SAGE game engine. Generals takes place in the 2020s. Players are given a choice of three factions to play rather than the two in the early parts of the Command & Conquer and Red Alert series. In Generals, the United States and China are the world's two superpowers, and are the targets of the Global Liberation Army, a generic Middle Eastern terrorist organization with an unclear agenda and a substantial military force. Both the United States and China are depicted as the protagonists in the series, and frequently co-operate with each other throughout the storyline. The three factions are thus engaged in a war similar to that of the real-life War on Terror. Each of the three factions are depicted and played in a different manner: the United States uses expensive state-of-the-art technology such as airborne drones and laser defenses as well as a superior air force and an unmatched command system, while China uses older combat-proven technology such as modernized napalm and Gatling guns. China's strength also rests in its sheer numbers—"horde bonuses" are given to large groups of units. The GLA, being technologically disadvantaged, often resorts to guerrilla warfare to achieve victory in the battlefield. Anthrax toxins and high explosives play a significant role in their tactics, but their true focus is control of the battlefield. Generals has been attacked around the world, with a national ban placed on it in China (despite a rather positive view of China throughout Generals and its expansion) and a censored version distributed throughout Europe after its initial release was yanked from the shelves. The sole expansion pack, Zero Hour, was released later that year, building on Generals to create a significantly different game. For more details on this topic, see wp:Command & Conquer (2013 video game). 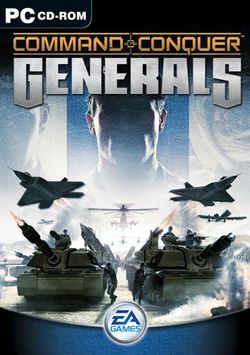 Originally announced as Command & Conquer: Generals 2 in 2011, the project was assigned to Electronic Arts' Victory Games development team and adapted to an online free-to-play (F2P) format. The game was renamed simply Command & Conquer and slated for release in 2014. Electronic Arts canceled the project during Alpha development in 2013. This page was last edited on 16 August 2016, at 16:17. This page has been accessed 114,430 times.